Loosing your phone contacts is a sad occurrence, especially when it leaves you with no other choice than to answer to any caller whose contacts has been erased with "Hello, Please who is this"? This leaves a negative impression on your personality and can dent the cordial relation you must have been enjoying with such person. Although, I have written on how to transfer contacts between phones here, but i was not specific regarding keeping it updated regularly. I have attempted quite alot of andriod apps, and I can vividly say that "Copy My Data" is One of the simplest app we could use to transfer contacts, back up and restore phone contacts and other files easily to online cloud storage. You may know alot of them, but only a few gives you full access for free as this particular app does. * Gmail Account, You can create on here if you don't have any. We would be looking at the bolded. The first is easy to carry out if you can understand this particular tutorial. --> Launch it and click on the next button. --> The App demands how you want to copy your data. 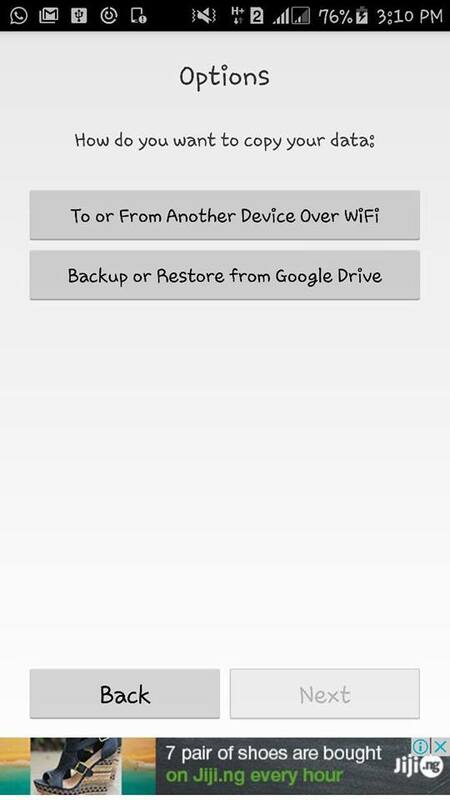 --> Select "Backup or Restore from Google Drive" and select Next. --> You are left with two options like "Backup Data to Google Drive"and Restore data from Google Drive. 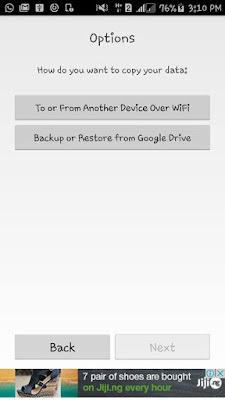 --> If you are doing this for the first time, then you should use the first option which is "Back Up data to Google Drive (Remember to turn on your mobile data to enable your internet resources). --> Within the space of two minutes or lesser dependable on the speed of your ISP, your contacts should be back up to your Google drive account. --> To ensure you don't loose any recently added contacts after the Back up to Google Drive, then i suggest you change your method of saving your contacts from Phone or SIM to your Google Account. This regularly updates the existing contacts you have as Back Up.See the below screen shot, you will notice that my current location for saving my recent contacts was changed to my email account (Google).Do same for yours by dropping down the menu to select Google. 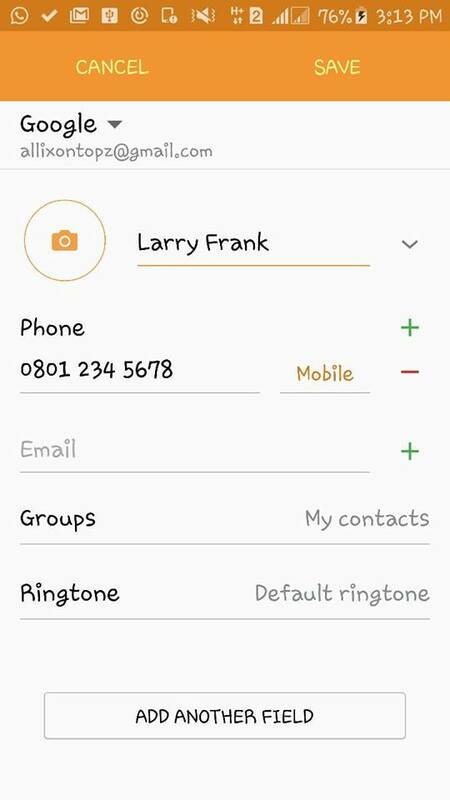 For example, let me assume i am adding the name +Larry Frank and his phone number to my contacts list like two days later after my Back Up, I won't be saving it anymore to my phone or Sim but to my Google Account as shown in the image above. 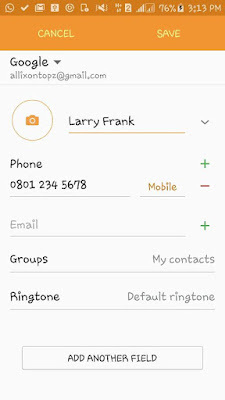 --> This particular style of saving your contacts makes it easy for you to retrieve your data down to the last added contacts in the situation of missing or stolen phone. 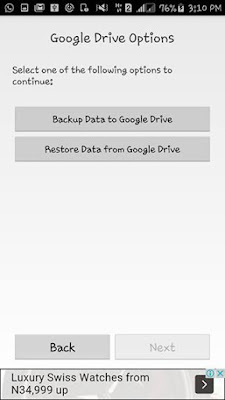 N/B: In a situation your phone gets missing or stolen and you got a new andriod or iphone, all you have to do is: Run or Install the "Copy My Data" application on your new phone, click on the Next button and select "Back Up Or Restore from Google Drive," followed by Restore Data from Google Drive. Your new phone should be updated with your contacts.Sign into your google accounts to get the recently added ones synchronized to your Phone automatically. This app can also be used to transfer contacts from one mobile phone to another, BUT currently i made this article for just the back up and Restore of contacts online. I love to hear what you have in mind, let us discuss via the comment box below.